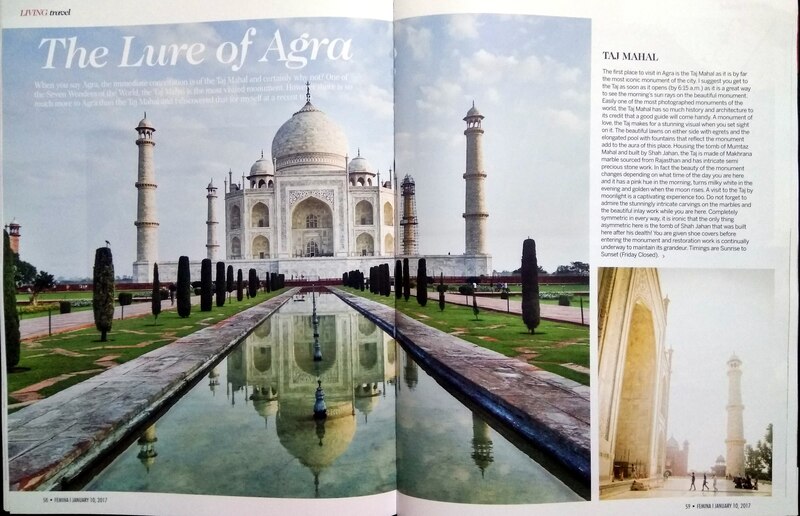 When you say Agra, the immediate connotation is of the Taj Mahal and certainly why not? One of the Seven Wonders of the World, the Taj Mahal is the most visited monument. However there is so much more to Agra than the Taj Mahal and I discovered that for myself at a recent trip. The first place to visit in Agra is the Taj Mahal as it is by far the most iconic monument of the city. I suggest you get to the Taj as soon as it opens (by 6:15 a.m.) as it is a great way to see the morning’s sun rays on the beautiful monument. 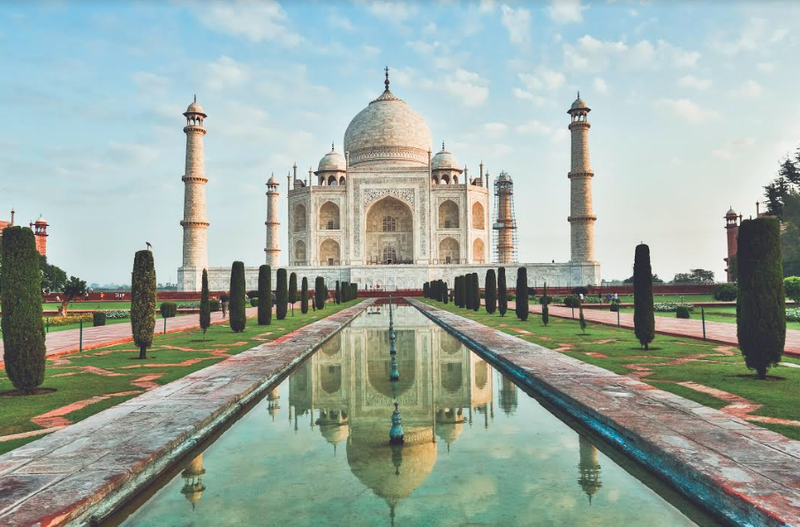 Easily one of the most photographed monuments of the world, the Taj Mahal has so much history and architecture to its credit that a good guide will come handy. A monument of love, the Taj makes for a stunning visual when you set sight on it. The beautiful lawns on either side with egrets and the elongated pool with fountains that reflect the monument add to the aura of this place. Housing the tomb of Mumtaz Mahal and built by Shah Jahan, the Taj is made of Makhrana marble sourced from Rajasthan and has intricate semi precious stone work. In fact the beauty of the monument changes depending on what time of the day you are here and it has a pink hue in the morning, turns milky white in the evening and golden when the moon rises. A visit to the Taj by moonlight is a captivating experience too. 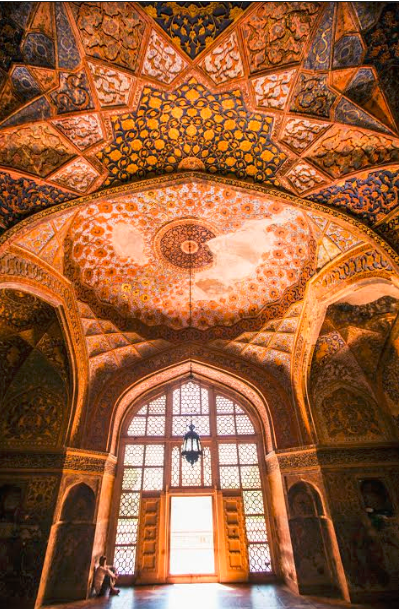 Do not forget to admire the stunningly intricate carvings on the marbles and the beautiful inlay work while you are here. Completely symmetric in every way, it is ironic that the only thing asymmetric here is the tomb of Shah Jahan that was built here after his death! You are given shoe covers before entering the monument and restoration work is continually underway to maintain its grandeur. Timings are Sunrise to Sunset (Friday Closed). Akbar’s Tomb at Sikandara (slightly away from the city) was started by the emperor himself who chose the site and the design plan. Like with most tombs it is a bit of a walk to the tomb and the beautiful red sand stone is a stunner. There are four gates that surround the tomb with the south gate being the largest. These have four white marble minarets similar to what you see at the Taj Mahal. The tomb itself is a four-tiered pyramid surmounted by a marble pavilion with a tomb structure that is only indicative of the real tomb present in the basement. The contrast of the white marble work against the deep red of the sandstone makes this a visually appealing monument as well. The tomb is adorned with decorated inlaid panels and a black slate and the geometric, floral and calligraphic designs are a delight to see. Said to be the former imperial residence of the Mughal Dynasty, the Agra Fort is a walled city which is today tagged as a UNESCO World Heritage site. The external facade is a beauty is red sandstone. With a huge wall for a boundary you will need a lot of time to explore this Fort so keep some time aside. In fact most part of the fort is not open to the public and yet I felt that there was so much more to see. 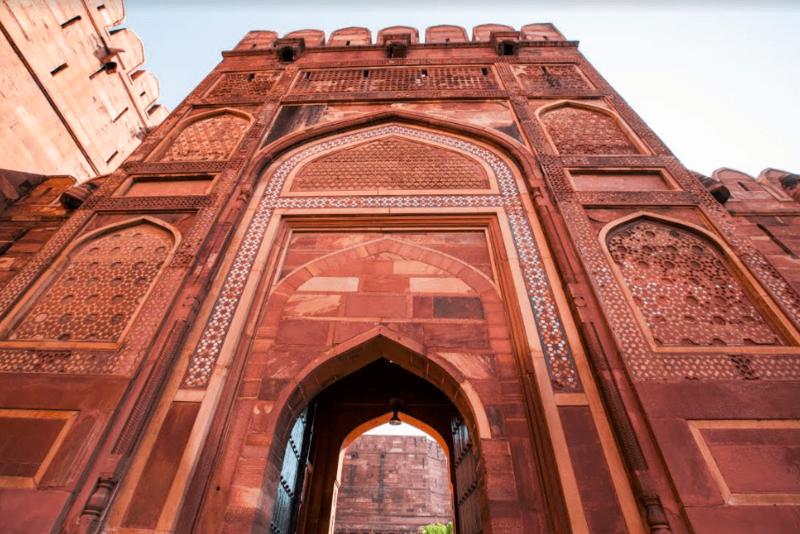 A mix of Hindu and Islamic architecture, the Fort has four gateways and is said to relect Akbar’s personality and is robust, dynamic and imaginative all at the same time. Said to have taken 8 years to build, the Fort has well maintained gardens and lawns in its precincts. 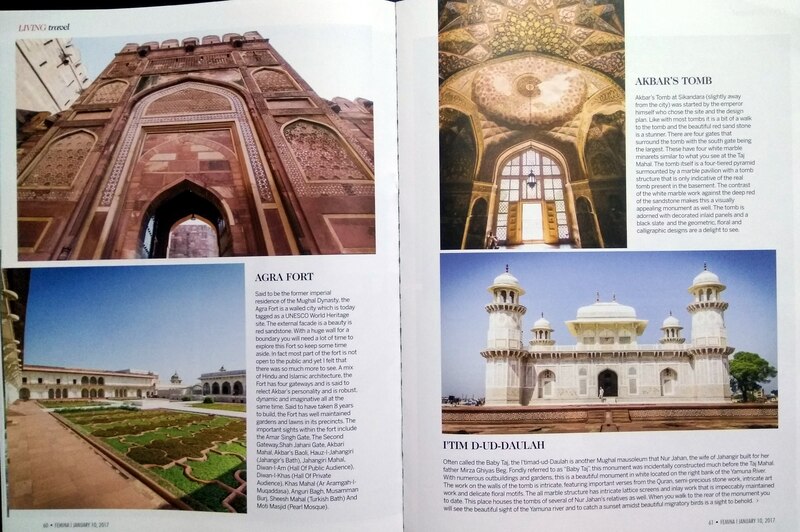 The important sights within the fort include the Amar Singh Gate, The Second Gateway,Shah Jahani Gate, Akbari Mahal, Akbar’s Baoli, Hauz-I-Jahangiri (Jahangir’s Bath), Jahangiri Mahal, Diwan-I-Am (Hall Of Public Audience), Diwan-I-Khas (Hall Of Private Audience), Khas Mahal (Ar Aramgah-I-Muqaddasa), Anguri Bagh, Musamman Burj, Sheesh Mahal (Turkish Bath) And Moti Masjid (Pearl Mosque). Often called the Baby Taj, the I’timād-ud-Daulah is another Mughal mausoleum that Nūr Jahān, the wife of Jahangir built for her father Mirzā Ghiyās Beg. Fondly referred to as “Baby Taj”, this monument was incidentally constructed much before the Taj Mahal. With numerous outbuildings and gardens, this is a beautiful monument in white located on the right bank of the Yamuna River. The work on the walls of the tomb is intricate, featuring important verses from the Quran, semi-precious stone work, intricate art work and delicate floral motifs. The all marble structure has intricate lattice screens and inlay work that is impeccably maintained to date. This place houses the tombs of several of Nūr Jahān’s relatives as well. When you walk to the rear of the monument you will see the beautiful sight of the Yamuna river and to catch a sunset amidst beautiful migratory birds is a sight to behold. If you thought that Agra was all about history and architecture, think again. Agra is home to India’s largest Bear Rescue Facility, Wildlife SOS. This foundation has done a remarkable job in stopping the cruel practice of bear dancing. You must walk through the Education Conservation Walkway, said to be the first of its kind in India. Located inside Sur Sarovar Bird Santuary, you will also be enthralled by the sight of a beautiful lake as you approach this place. 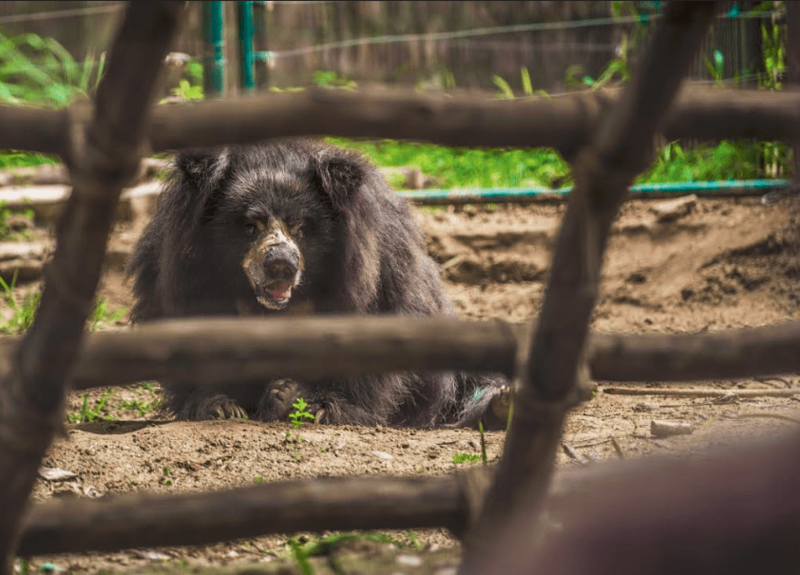 The sanctuary is unique as it now houses all rescued dancing bear – a cruel practice that has since been eradicated thanks to the efforts of the team here. The bears are grouped in various enclosures and we were told that some of the bears are also blind. The volunteers feed the bears and look after them with so much love that it is indeed a heart warming sight. 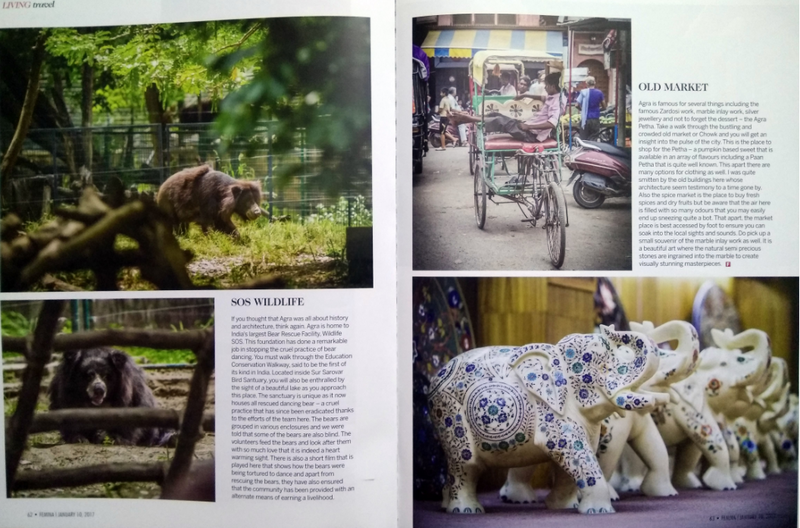 There is also a short film that is played here that shows how the bears were being tortured to dance and apart from rescuing the bears, they have also ensured that the community has been provided with an alternate means of earning a livelihood. 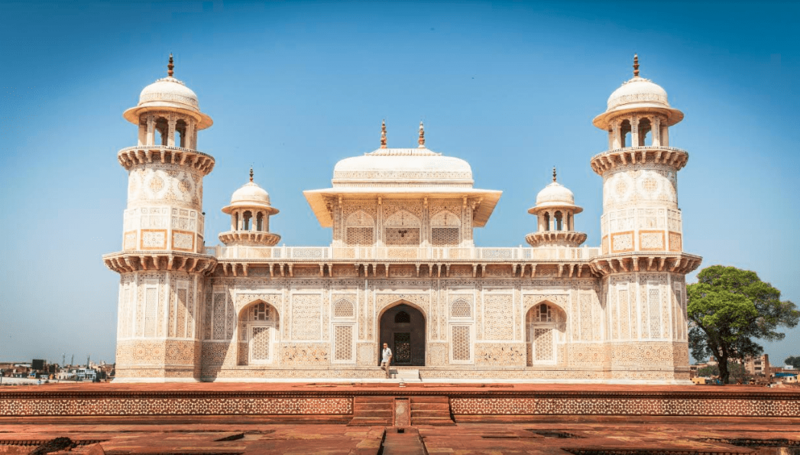 Agra is famous for several things including the famous Zardosi work, marble inlay work, silver jewellery and not to forget the dessert – the Agra Petha. 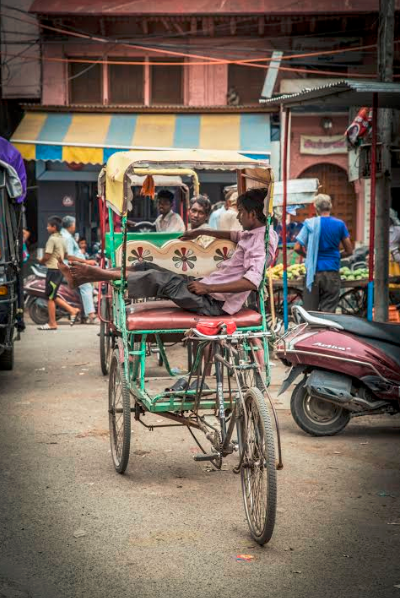 Take a walk through the bustling and crowded old market or Chowk and you will get an insight into the pulse of the city. This is the place to shop for the Petha – a pumpkin based sweet that is available in an array of flavours including a Paan Petha that is quite well known. This apart there are many options for clothing as well. I was quite smitten by the old buildings here whose architecture seem testimony to a time gone by. Also the spice market is the place to buy fresh spices and dry fruits but be aware that the air here is filled with so many odours that you may easily end up sneezing quite a bot. That apart, the market place is best accessed by foot to ensure you can soak into the local sights and sounds. 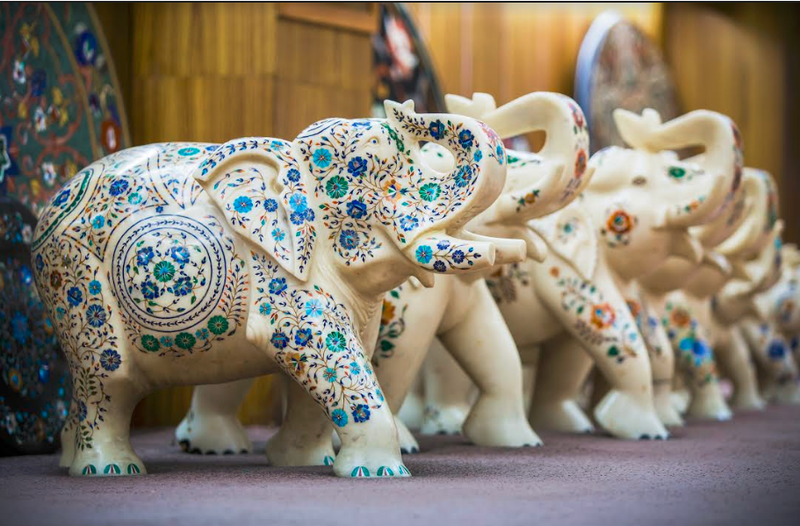 Do pick up a small souvenir of the marble inlay work as well. It is a beautiful art where the natural semi precious stones are ingrained into the marble to create visually stunning masterpieces.